Just how does an 18-year-old from Melbourne’s Mornington Peninsula become a fan of the Toronto Raptors, a professional basketball team located over 16,000km away? While most Australian teenagers are likely to follow the Golden State Warriors, Los Angeles Lakers or Ben Simmons’ Philadelphia 76ers, Will Hamill has good reason to support the Association’s only franchise in Canada. He lived in the Great White North for 12 months. When Will was just 14, he and his family - father Steve, mother Karen, older sister Meg and younger sister Lucy – uprooted their lives to relocate to a township in Central Ontario approximately two hours north of the province’s capital city, Toronto. Steve, a long-term employee of Victoria’s Department of Education with a master’s degree on the subject of homesickness, went on exchange which involved a direct family swap with his Canadian counterparts. “My parents did it in 1998 and they always wanted to have the experience with the kids,” Will said. “It’s not the easiest program to get into. But when we applied, we got it and it was kind of the best year for it. Although it turned out to be an incredible experience, Will was apprehensive at first. Initially, he was left with a massive void to fill during a fierce Ontario winter where sub-zero temperatures and heavy snowfall were commonplace. Here was an active, footy-mad teenager with a love for the beach pulling on multiple layers of clothing just to step outside his front door. But Will took the novel challenge in his stride, quickly making friends and joining them to partake in Canada’s national winter sport: ice hockey. However, given he was in a country known for raising their youth to ‘skate before they can walk’, the Victorian was at an immediate disadvantage. I could not put one foot in front of the other over there, let alone hold a stick while you’re doing it. It was just crazy. Having accepted his lack of ability on the ice hockey rink, Will tried his luck at the world’s fastest racquet sport. “I actually got so bored during the winter that I joined the Badminton team just to do something,” he said. At the end of their Canadian adventure, the Hamill family returned to life at Somers School Camp where they have resided since Will was a pre-schooler. Growing up at an outdoor education camp exposed Will to new faces every nine days, as well a host of outdoor activities from rock climbing to surfing, each designed to foster independence. It also provided ample room for him to run around and kick the football, but for the talented Balnarring junior, the dream of playing AFL still seemed out of reach. It wasn’t until 2017 that Will received an opportunity on the elite talent pathway, selected in the Dandenong Stingrays’ TAC Cup squad. Going into the season, the pacy left-footer was simply happy to be on the list. But Will’s goals quickly shifted after he became the first Stingrays bottom-aged player to play every game in a season, an achievement the humble Hamill described as a ‘bit lucky’. 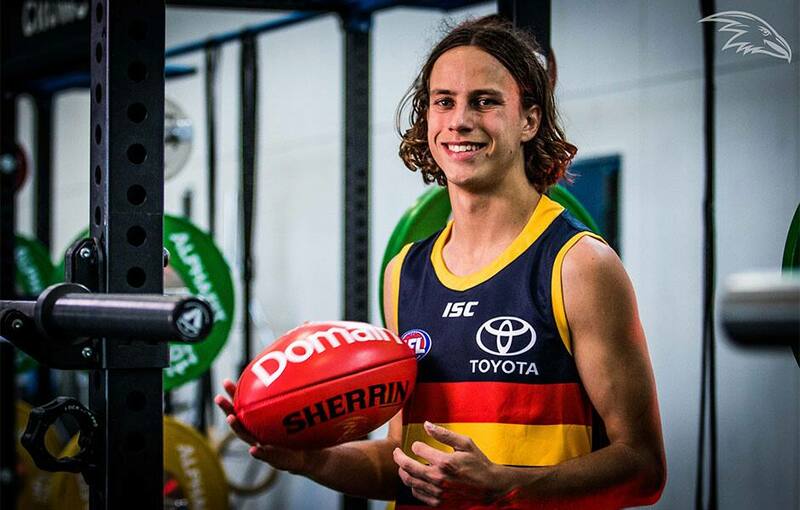 “I was actually quite stoked just to be on the list with them for the Under-18 TAC Cup,” he said. “I went into that year not really expecting too much but was lucky enough to play every game, which was nice. “It wasn’t really until the end of that year, my under-18 bottom age year, that I thought ‘this could happen’." 12 months later, it did happen. Will was sitting on the couch at his grandparents’ house with his grandparents, parents and sister, keen to keep fuss to a minimum. He wasn’t feeling too much pressure until the names started to come thick and fast. With Adelaide on the clock at pick No.30, Will remembers his name being called but struggles to describe the exact emotions he felt at the time, a mixture of disbelief and jubilation. “I was sitting back, still getting very tense but when my name got called out it was a bit of a surprise and it was a feeling that was indescribable,” he said. “First they kind of butchered my name a little bit. They said Will, then William, so then they said my name and it all went into a kind of shock, almost. “I got up and everyone else was standing, so I gave mum and dad a hug. Mum burst into tears, but tears of happiness of course, and everyone was really excited. It’s a bit of a blur now, but it was so good. Complete euphoria, I guess. An AFL dream now a reality, the tight-knit community in Somers were quick to get around their teenage prodigy with messages of congratulations and support. Will paid tribute to his father Steve as the biggest influence on his football career, as well as Stingrays coach Craig Black. He was also thrilled to become the first player to be drafted onto an AFL list from the Balnarring Junior Football Club, which was only established in 2006. “To be the first one drafted is a huge honour, of course. It’s truly amazing,” Will said. “The calibre of players that come out of Balnarring, it’s a really strong junior club, so that is pretty special. Now in Adelaide, having just embarked on his first official media appearance, Will sits relaxed in the Crows’ media room at West Lakes. Both he and fellow draftee Lachlan Sholl are wearing their Club polo shirts, but Will has gone far more casual by sporting a pair of grey French Terry 3-Stripes shorts and black thongs. Engaging and articulate, it’s hard to fathom this well-spoken teenager turned 18 just 10 days prior as he demonstrates a level of calmness well beyond his years. Reflecting on his year in Canada, he responds emphatically when asked whether the experience equipped him with the tools and resilience to live interstate, away from his family and friends. “I reckon it’s pretty different as well, because it’s only a 50-minute plane ride over and you can drive over as well. “Obviously I’ll see my parents and my mates a lot more than when I did back in Canada. “Living there has definitely helped me a lot to just adjust to a new lifestyle. With Will’s allegiance to the Toronto Raptors declared, the new Crow is a safe bet to integrate seamlessly into Adelaide’s basketball-loving playing group. He can chat hoops all day long with basketball converts Hugh Greenwood, Josh Jenkins, Tom Doedee, or super fans Eddie Betts and Sam Jacobs. The love of surfing and the outdoors is a passion he shares with the ever-popular Rory Sloane. Whether he can find someone to talk about Badminton with remains a mystery, but he now has a plethora of new mates to talk football and life with. Mates that have made him feel welcome and right at home in just his first week at West Lakes. “It’s been really amazing. All the boys have come up and introduced themselves,” Will said. They really make an effort to make you feel like you’re one of them already. It’s a really good feeling.